Take the hassle out of installing a wooden 4 x 4 post into soil with the Mayne No-Dig Ground Anchor. 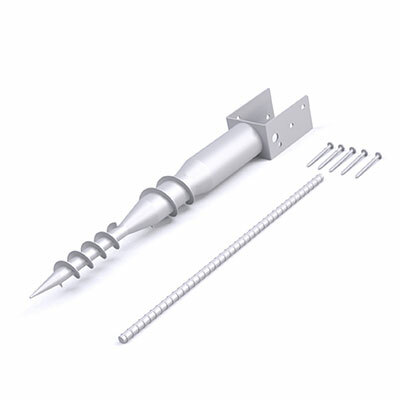 The pointed, corkscrew base on this galvanized steel anchor inserts into your soil easily, and the included, 20" section of rebar helps you screw it into the ground in moments. Once this anchor is stable in soil, place your existing 4 x 4 wooden post (not included) into its squared top sleeve and secure it with the included lag bolts. This anchor is ideal for standard soils, and can be used with any of the Mayne mailbox posts. Place your existing 4 x 4 wooden post in your yard with help from this No-Dig Ground Anchor.